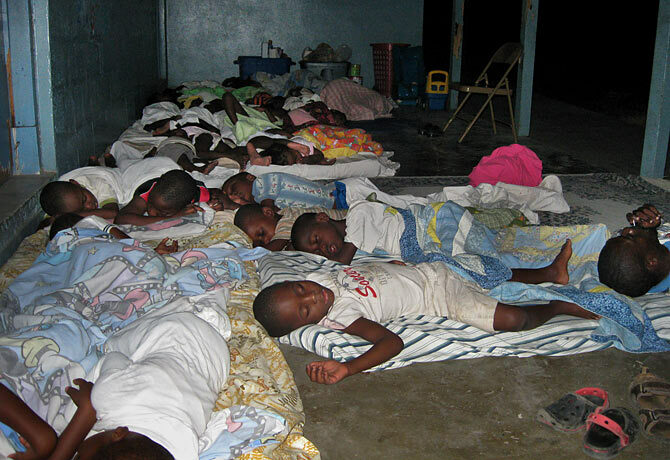 With their own building unsafe and the neighboring field where they slept the night of the earthquake getting more crowded, the children of Angel House spent five nights sleeping on the concrete under a tin roof at the nearby Quisqueya Christian School. When the earthquake struck Haiti on Jan. 12, Abbey McArthur, 26, was half-way through her year-long commitment to teach kids at the Angel House orphanage in Port-au-Prince. "It felt like God had picked up the earth and was just shaking it back and forth," the Indiana native said. She was less than a mile away, exercising at another school when it happened. In the nightmarish aftermath of those destructive 15 seconds, as she headed back to look for her students, as she crawled over rubble and heard the locals mourning in the streets, the last thing she probably could have imagined was that NASCAR would have something to do with rescuing her and her wards. But that was just what was about to happen in North Carolina where Rick Hendrick lives. Hendrick's NASCAR team has won the last four Sprint Cup titles and nine overall. So he's used to doing things fast. On the morning after the earthquake, Hendrick, the owner of one of the largest car dealerships in the country, decided to act quickly. He instructed team general manager Marshall Carlson and aviation director David Dudley to see what they could do to help. He had personal reasons for it all. "You see people in agony and pain and hurting in a disaster and it doesn't take me long to flash back to the night that my family was on the side of a mountain in Virginia and we couldn't get to them," he says, recalling the plane crash that took the lives of his son, his brother, two nieces and six others in 2004. "These people [in Haiti] needed help right now." Back in Haiti, the evening before, McArthur was clambering over the rubble of a large building that had collapsed into the street at the corner of 91 Delmas, where she had to turn to get to the orphanage. She wondered about the family that lived on the first floor and the vendors who were always there at that time of the day. What had happened to them? She recalled several discussions she had with different people over the previous months about how Haiti was due for a significant earthquake and how the infrastructure would crumple if that happened. But it was the 11 children she taught and 15 younger ones at the orphanage that were paramount in her thoughts. And so she was relieved when she finally got to Angel House. The main building, where the children had been during the quake had survived. Francois Jean Louis, a translator for the orphanage told her the kids, who ranged six months to eight years old, were all safe and had been relocated to a neighbor's field. She was surprised at how calm they were and both thankful and amazed that none were injured despite being among many things that had fallen inside the building. But even though the main orphanage building had not fallen, it was no longer safe for them to remain in it. Like most of the city, MacArthur and the children would spend the night outside. The next day they would move to the protection of the nearby Quisqueya Christian School for five nights, sleeping on a concrete floor under a tin roof. All the kids from Angel House were at one point or another of the long process of being adopted by parents in the U.S. and Canada. But paperwork and seemingly endless bureaucracy had kept them in Haiti. Among those waiting for to adopt were Cara Boone and her husband Kevin of Titusville, Florida. The couple were almost three years into the process of adopting two children from Angel House, Rebecca, 3, and Kervens, 4. Upon hearing about the quake, Cara and Shannon Hoffmann, a staff member of Three Angels Children's Relief, the parent organization which also operates a health clinic and an elementary school in Port-au-Prince, started working the phones to fasttrack the process. They called every politician or agency that they thought could help. Eventually, they were in contact with Whitney Reitz at the U.S. Citizenship and Immigration Services (USCIS) which operates out of the Department of Homeland Security. "From the moment the disaster happened, this entire office was completely seized with putting in place a plan to try to get something done," says Reitz. Meanwhile, Cara's husband Kevin, who is a pastor at the First Christian Church in Titusville, had been in touch with folks he knew at MFI  which had at its disposal the planes of Rick Hendrick. The first Hendrick Motorsports plane had landed in Ft. Pierce on Friday, January 16 and ferried a load of doctors and medical personnel to Port-au-Prince the next day. Among its passengers on that trip were Three Angels co-founder Gretchen Huijskens and Kevin Boone. Late Sunday night, about an hour after they had gone to sleep as Huijskens recalls, Hoffman called and told them to be at the U.S. embassy by 5 a.m. The paperwork was being processed,  not just for Rebecca and Kervens but for all 26 of the Angel House orphans. About 12 hours after they reached the embassy, they were on an official bus, headed for the airport, praying they could get there early enough because the plane's ability to take-off would be limited after dusk. At 7:30 p.m., Monday Jan. 19, the plane with all on board, touched down in Florida. The 26 kids of Angel House represent the first orphanage in Haiti to get out in its entirety after the earthquake. "I am so joyful for the families that are reunited with their kids," says Reitz, who has two photos of the kids from Three Angels taped above the computer on her desk, one at the orphanage and one when they were arriving in Florida. But she cautions, "Everyone's still swimming in it and there are hundreds and hundreds more. This isn't going to go away any time soon. I just pray that the spirit of generosity won't go away as soon as the media attention is over."